December 10, 2004 - As part of its media blitz for its line-up of killer PSP titles, Sony Computer Europe interviewed each of its development teams for the games in production. IGN will have more on these games when possible, but until then, here's the words straight from the mouth of its makers on this game. Q: We've seen Wipeout on PSone and PS2, can you tell us what is different about this game? Colin Berry, Designer, Wipeout Pure: It's on a handheld machine! Seriously though, quite a bit is different; there are 12 brand new tracks (along with four classic tracks hidden away). Whilst some of the ship names will be familiar, all the ships are newly modeled, textured and have new handling stats. Another important new feature is Multiplayer via WiFi, for the first time eight people will be able to hook up and race against each other using the WiFi capability of the PSP. The weapons and pick ups have been refined, some old favourites and have been given a face lift and there are a couple of new surprises. Zone mode, which made a successful debut in Wipeout Fusion, is back and this time it has purpose built tracks, designed specifically to enhance the Zone mode experience. Q: So it's not just a port? Berry: Definitely not, it is anything but. When we started thinking about a version of Wipeout for the 'new handheld machine' we wanted to create a new version of Wipeout. Doing a port was never an option. Sure, we do have four classic tracks (one from each of the major iterations of the game) but even these have been recreated from scratch and they are housed in all new stylised environments. 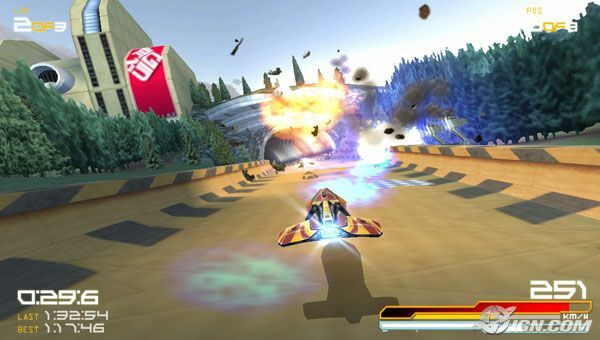 The team has wanted to do a handheld version of Wipeout for a long, long time and once the PSP was announced we knew we finally had a handheld platform that could do the game justice. Had we gone down the route of porting one of the earlier versions I think we'd have been cheating ourselves and the fans of the series. Q: What new elements have you introduced to the game? Berry: The first perhaps most crucial element is not new as such, but a return to the very early days. We have abandoned the dynamics system from Wipeout Fusion, the ships are no longer 'locked' to the track, they are free to bounce and leave the track when you move fast over the undulating surface it is a throw back to the feel of the earlier games, that was one of the earliest decisions made and the game feels like Wipeout because of it.....hence the name Wipeout Pure! One key new feature is the way in which players get their energy back. The old pit-lane system has gone; now whenever you pick up a weapon you have the choice to fire it, or to absorb energy from the weapon, which in turn replenishes your ship's energy. This alleviates the problem of having to race half a lap tentatively as you try to make it to the pit lane. Instead you can replenish your energy whenever you pick up a weapon, making for some interesting gameplay choices: Do you fire your missile and try to take first place despite having low energy, or do you absorb the energy and settle for second place? There are two new teams that compliment the six others that people will recognise from previous versions of the game. All the ships have been created in a way so that they all have pros and cons. We've balanced the stats so that no one ship becomes redundant and no one ship is easily the best to use on every track. We do not want the player to feel that they have to use a certain ship to win a certain race. The ships can also perform a side-shift manoeuvre which is pretty nifty and allows the player a greater range of control on the ship. There is also an airborne move but that is remaining under wraps for the moment. As mentioned earlier there is full WiFi multiplayer support which is really good fun. There is also the ability to swap ghost ship data with friends and to compare records. Players will have their own individual profile which will track their progress through the game and their individual game statistics, however they can also synchronise their records with friends and have both global and personal record tables. 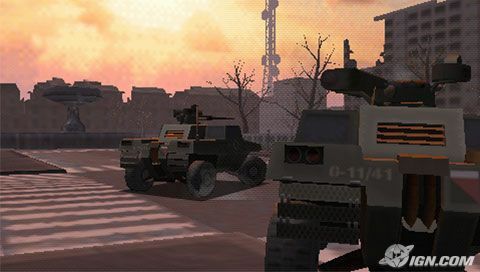 Zone mode has had tracks specifically designed for it, which gives it an identity of its own and further establishes it as a main feature within the game. It has also been refined in the way it plays hopefully pushing it further than when it debuted. Q: Is this created by the same team that worked on the previous games? Berry: For the most part no, only a handful of the team has worked on any of the previous iterations. Having said that, everyone on the team knows Wipeout, knows its history and what the game is all about. It's a good mix - we have a lot of fresh ideas and approaches, coupled with an overall mentality and aim that involves retaining the essence of Wipeout. 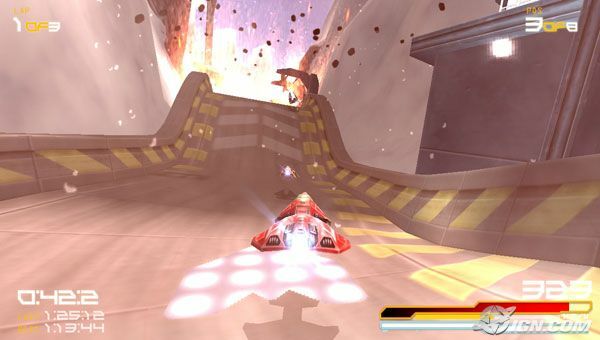 Indeed the title itself Wipeout Pure was born of the desire to return to the pure elements which made the early versions of Wipeout so popular. Q: Are there many major differences in the development for a software title for PSP? Berry: Initially we thought there would be, when the project was first started we thought that we would not need a huge team and that development would not take so long. However as time has gone on the size of the team has grown to rival the team that worked on Wipeout Fusion. The machine might be small, but it's powerful, and content-wise there is so much in this game we found we needed more people than we had first expected. Q: Tell us more about the WiFi elements in the game. Berry: There are two sides to the WiFi features in the game. The first is the main area and that is the WiFi gaming itself - current plans allow for up to eight players to compete against each other in either a single race, a league or a time trial race. The second side allows players to swap ghost data and to compare and sync their records via WiFi. Players will be able to compete against their friends' times and ghost ships. Of course players will not lose record of their own times once they have synchronised data - they will still be able to view their personal best on a track should they so desire. Q: Are you going to include any downloadables that can be used to enhance the title at a later date? Berry: Absolutely, this is a big part of what we have planned for the game, and is one reason why the team has grown to a large size. Players are going to be able to download new tracks to race, new ships, new skins for the front end and new music tracks as well. This is a feature that is unique in the PSP and allows for a new delivery method for content, adding extra value after launch for its titles. Q: As a developer, what is the most exciting element of working on software for PSP? Berry: It's a new format, which is always exciting if a little daunting at first. Not only that, it is also the first handheld Sony has made and we are bringing a well known franchise to it, which adds weight to the pressure and expectancy, but it's a nice kind of pressure. The PSP is allowing us to do things that were not feasible on PS2, for example, the downloaded content. Eight player WiFi gaming is also pretty exciting. Q: What features has the game got that takes into consideration the fact that the PSP is portable? Berry: One thing that has had a fair bit of attention is the controls and feel of the game, the PSP does not have as many buttons as a PlayStation 2 pad so we have had to be imaginative when considering how the game plays and feels. It has not been restrictive but it has required some thought to get the best results. Developer Travellers Tales surprises us by taking the wheel of this racing series. 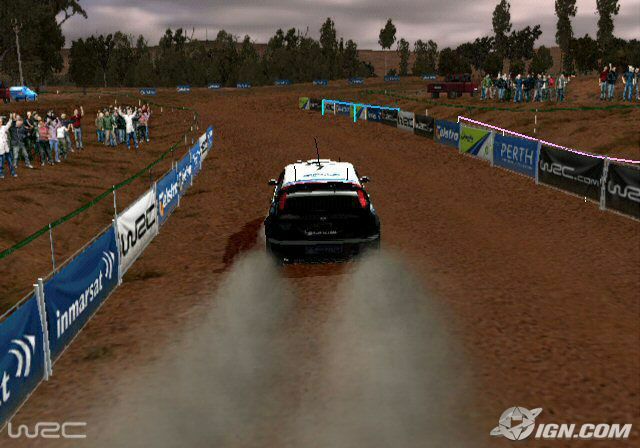 Q: We've seen WRC on PS2, can you tell us what is different about this game? Travellers Tales, developer of WRC: WRC will utilise all of the same licensed cars, drivers and tracks / stages as PS2 however the emphasis with WRC is really more about easily accessible, pick-up and play gameplay with more against arcade style against the clock challenges. Travellers Tales: No, WRC PSP is built from a completely new code base and entirely different set of art assets than PS2. Travellers Tales: All the familiar Quick Race, Time Trial, Single Rally and Championships will of course feature, but all are now based on a more arcade style, in order to take maximum advantage of the quick fire nature of the PSP. Travellers Tales: No, different developers are working on this title and this gives a significantly different visual style and feel to WRC on PSP. Travellers Tales: We've found that our development teams have rapidly gotten used to developing for PSP. What has surprised many of us, however, is how powerful the PSP actually is once you begin to better understand the hardware. This means that although teams are slightly smaller than PS2, comparable team sizes are required to make the best of the hardware. Travellers Tales: We plan to include the opportunity for up to 8 players to play head-to-head via WiFi on an ad hoc basis. Players will be able to compete on 16 specially designed looped stages. WiFi will also allow players to transpose their stage times using ghost cars with other players and other PSPs. Travellers Tales: Yes, we plan to support the title over its life with the inclusion of bonus tracks and cars as well as other licensed elements. Travellers Tales: I guess being there at the start. No portable games console has ever had the power to truly deliver powerful 3D gameplay before and the power of the PSP will undoubtedly take many people by surprise. It certainly surprised us! Q: What features has the game got that take into consideration the fact that the PSP is portable? Travellers Tales: We wanted to avoid streaming lots of data so as to prolong battery life. Obviously this isn't even a consideration on PS2, so you have to think about how to get the best out of the PSP without relying on old common place techniques. 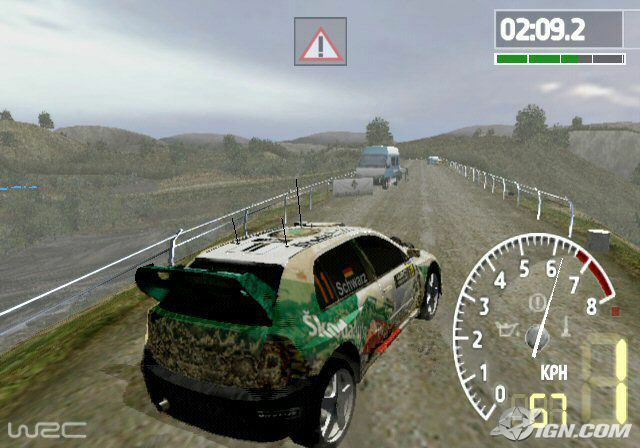 With WRC PSP, we recreate WRC's breathtaking vistas by cleverly pre-loading much of the data. We also decided to completely re-design all of our circuits, so as to have far more close-to-the-player, high speed action. Q: Fired Up is one of the new, originally developed titles for PSP - can you give us a bit of background on the game? SCEE London Studio, Developer of Fired Up: Fired up is a brand-new action game from the London Studio. It's a vehicle combat game with a free-roaming, story-based single player mode and a blindingly fast-paced, enormously expansive multiplayer mode. The player controls a team of cool and quirky vehicle combat specialists who find themselves fighting the invasion of a totalitarian superpower in a small eastern European country. The team members have diverse backgrounds, unique customised vehicles and their own joyous way of dealing out extreme violence. Q: What are your favourite features in the game? SCEE London: Four things. Firstly, we've managed to get big, free roaming levels in our single player mode, large outdoor environments (cities and countryside) that the player is free to drive around at will, full of enemies and cool little touches like turrets and trains that the player can take control of. Integrated into this big world are numerous story-based missions and arcade-style mini-challenges. Secondly, we've developed a game that can be fun if you play it for 30 seconds or if you play it for three hours. You can literally boot the game up and play it for under a minute and have made progress in the story mode. You can also spend hours and hours trying to find all the hidden extras in the environments if you want. Thirdly, we've all been surprised that graphically, the game looks a lot better than the team's previous PS2 release. The PSP is a really powerful piece of kit. Finally, we've got a multiplayer mode that rivals most modern PC or console releases. Q: What games have the team worked on before? SCEE London: The last game some of the team worked on was the London Studio's critically acclaimed PS2 online title 'Hardware: Online Arena'. We based our multiplayer mode on elements of this game. We also have a batch of new blood on the team who have worked on other London Studio games as well as titles for Sega, Criterion, Warthog and Lionhead amongst others. SCEE London: We have a full-scale 2-8 player multiplayer mode using the PSP's WiFi capabilities. Twelve maps and eight game modes, including Deathmatch, Capture the Flag, King of the Hill, Bomb the Base and more. The player can also unlock extra vehicles for multiplayer by playing through the single-player mode. This is the PSP launch title that really shows off the multiplayer capabilities of the machine. SCEE London: We are currently looking at providing additional multiplayer maps after launch, but nothing is confirmed at the moment. SCEE London: It's a portable PlayStation! It really doesn't get any more exciting than providing a launch title for a platform like this. SCEE London: There are technical considerations that the programmers have to take into account, but as a designer, I haven't really noticed any significant restrictions that impact the game design. Obviously we have a 16:9 aspect ratio screen which makes HUD design different, and also the controls on the PSP are different (more elegant) to most home consoles. We have made sure the game can be played for shorter periods of time than home console games, but other than that, we have always thought of this as a fully featured, modern console game. Q: We've seen football games on PS2, can you tell us what is different about this title? 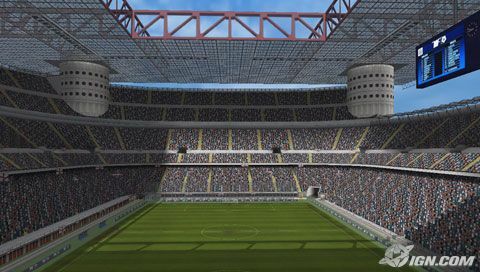 SCEE London Studio, developer of World Tour Soccer: We've focused the game modes around the strength of the PSP, i.e. its portability. We have therefore extended Challenge Mode offering a rich reward structure in the form of unlockable content. Each challenge gets harder, with the rewards getting better. As this is based around a high score table (rather than a football score), we hope to encourage what we call 'pass and play', where the PSP can be passed amongst a group of competitive friends to see who can get the best score. We have focused our competitions toward a single player, but in keeping with the unlockable content / reward structure. Players will start with a small sum of money, only being able to afford mediocre teams, and with success comes more money, better teams etc. These follow through to exhibition mode, and WiFi mode, such that the volume of content you have at your disposal is also a mark of how far through the game you are. Being portable and single player, we have also had to cater for multiplayer Football in a different way to PS2. Using WiFi ad-hoc mode, we allow users to see all other users in their vicinity, challenge them to a game, and then take them on! A: No, although we have maintained the accessibility, depth and fun of the PS2 versions! A: The design has to take into consideration the nature of the new console - small screen, portability - etc., which does change some approaches to implementation. A: Football is a very social game, and therefore it was a priority for us to cater for this on a single player platform. Football PSP therefore offers 1v1 gaming, which we will develop to 4v4 with subsequent releases. A: Not in the initial version, but PSP has brought up a host of application ideas for downloadable content. Q: As a developer what is the most exciting element of working on software for PSP? A: To be involved in the development of a first generation product to coincide with the launch of the platform is very exciting in itself. However, the true excitement comes in adapting the gameplay in fun ways for a portable platform, especially when thinking about people playing Football on planes, trains and buses, at school or work! A: WiFi was the biggest consideration. As was stated above, football is a very competitive and social game, and we didn't want to lose that. Catering for the single player football fan, and providing them with new ways of playing games in a more 'portable' way was always a goal. However, the PSP is a very good console to develop on; its power and features mean that not too many compromises need to be made when compared with other consoles. Boa geile Pics PSP-User ! Leider kann ich den Text nicht lesen ! Könntest du mir sagen was dass für Games sind ? SCE's cute golf game is now hitting the links all over the world. 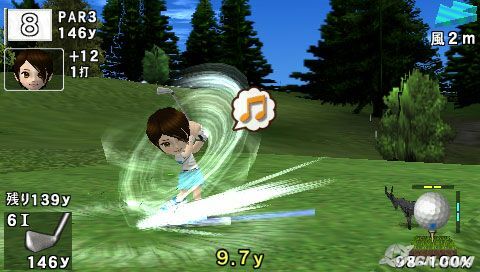 Q: We've seen Everybody's Golf on PS, can you tell us what is different about this game? Sony Computer Entertainment: This will be the first time Everybody's Golf has appeared in Europe since the original PlayStation versions, and it's moved on massively since back then. There are loads of features which have never appeared in a European release of this title. There are lots of courses - including real ones, mini golf for a fun challenge, and loads of 'power ups' for purchase with your winnings. 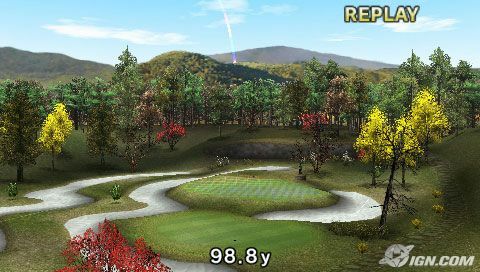 It's a fun and appealing game, but the various courses and playing styles will make sure that even seasoned PlayStation golfers will find a challenge. The true to life physics will ensure that even the most serious PlayStation golfers will find a challenging and thrilling game. And, Everybody's Golf PSP is the first time in the series that the characters are fully customisable: By leveling up different skills, and changing the outfits and hairstyles, users can create a truly unique character. And of course, users will be able to play against other players through Wi-Fi networking with their own characters. SCE: This is a totally new game. SCE: New characters, new courses, new character customisation and level up system, Wi-Fi gameplay. SCE: The development process is similar to the PS2, although of course the technology used is different. SCE: Up to 8 players can play together in a WiFi battle. Everyone plays simultaneously and the score will be shown at the end of each round. Also players can choose to start a one-on-one match with another player. SCE: The fact that the game can be played anywhere, anytime, and can be connected with other players without any cables for multiplayer games. It makes playing games wirelessly truly intuitive and easy. It opens up so many opportunities. Well now, Sir Daniel Fortesque, you're looking chipper! 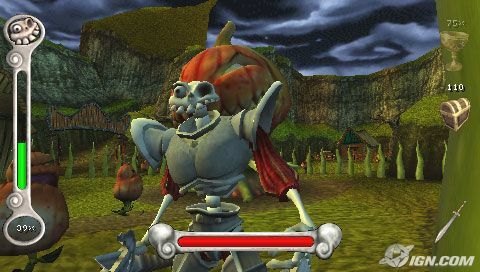 Q: We've seen MediEvil on PS one, can you tell us what is different on the PSP version? Piers Jackson, Producer, MediEvil: Pretty much everything is different! Whilst we've taken the basic story and some of the locations from the original game, all the code, graphics and voices are different and we've expanded the plot, added mini-games, multiplayer facilities and even a PSP-friendly save anywhere function. Jackson: Absolutely not, everything has been created from scratch. The ideas that we thought worked well in the original have been preserved although in many cases their use has been altered or repositioned to keep it all fresh, even to those who played the original. Q: What elements have you introduced to the game to make it different enough to be considered a brand new game? Jackson: New combat manoeuvres, new levels, characters, and bosses. There have been significant additions to the plot line in the form of the Anubis Stone, which strengthens the story arc and the creation of Al Zalam to act as Dan's internal monologue and the player's guide. Q: Why didn't the MediEvil series appear on PS2? Jackson: Largely because we were busy on other projects. After MediEvil 2 on PS one some of the guys had been working on the MediEvil games for five years and they wanted to work on something new; by the time they'd done a game on PS2 it was time to do something for PSP and MediEvil seemed perfect. Q: Are there any of the original team members working on the PSP game? Jackson: Directly on the team the only person is Mitch Phillips, although he is the Lead Artist, so it's a pretty big link! Many of the original team still work in the studio though, and they're always available for hints, tips and general advice. Oh, and we're still using the original voice of Dan! Jackson: The biggest difference is that it's a new platform! We started, not only with no code or engine, but for a long time without any Development Kits - that makes for an interesting ride. Actually, logistical difficulties aside the biggest differences are in the gameplay challenges of a portable console. We were used to developing for PS2, or PS one back in the day, but now we had to consider what a player would want from a PSP, such as save anywhere features and shorter, more intense levels. It really does change the whole way you go about developing a game. Jackson: We've looked to incorporate WiFi game modes in two ways. All of the game's mini-games offer a head-to-head challenge mode where players can battle to survive the longest or obtain the highest score. 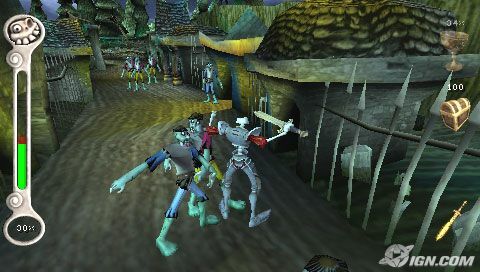 MediEvil will also feature a checkpoint style race mode using the game's levels where one player's success penalises the other player's time offering an interesting tactical challenge balancing a straight race with seeking to complete a level more thoroughly. Jackson: We're still examining the possibilities of having additional game content post release in the form of mini-games and new weaponry. Interestingly we designed and built a MediEvil style ship for WipEout Pure, so keep an eye out for that at launch! Jackson: To date the PSP is by far the most powerful and feature-rich hand-held available, far and away the most exciting element of developing on the system is pushing the boundaries in terms of gameplay and art on a hand-held. You really won't believe the clarity of the screen! Jackson: I'm sure everyone is saying pretty much the same thing, but offhand ours are a save anywhere feature, dip in and play mini-games, and a plot structured into more milestones than a conventional game to allow for shorter play sessions without losing the story-line or direction. The 411 on the zoom-zoom. 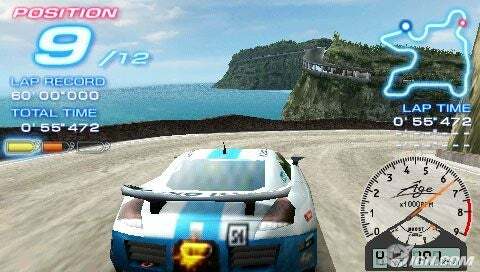 Q: We've seen Ridge Racer V on PS2, can you tell us what is different about this game? Namco. 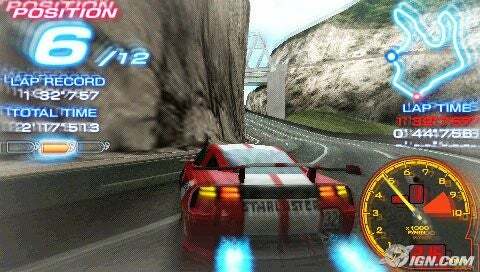 The PSP version features a selection of popular courses from previous installments throughout the Ridge Racer series. All graphical effects, sound and features have been improved and refined to offer a brand new experience. 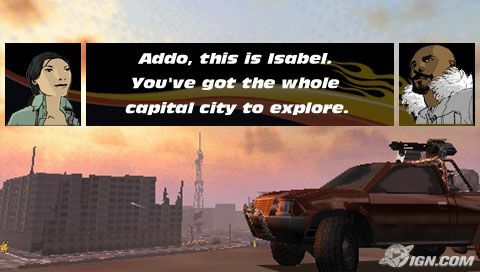 There is also a wide range of soundtracks available from throughout the series, and cars can be upgraded. Namco: No, this is the essence of the whole Ridge Racer series, distilled into one game for portable play, with all new features added. Namco: The main single addition is the Nitrous system: Nitrous is stored up when the player drifts around corners and can be triggered at the correct time. WiFi play between players is the next important feature brand-new to the series. This means the drift, previously a great feature, now takes on a whole new relevance, and becomes an integral part of your racing strategy. Namco: Up to 8 players can play using the Wi-fi feature. Using a selectable handicap system, players can compete seriously (no auto-catch up! ), or just play for laughs. Namco: There will not be any downloadable features in this title. Namco: We were very impressed with the graphical and sound capabilities of the hardware, and tried our best to use these to the fullest extent possible. We think players will be very surprised as to the extent of the smoothness and polish of what we have been able to achieve. For example effects such as lighting on the road surface, animated scenery, environment mapping, light trails and motion blur have all been included. Q: What features does the game have that take into consideration the fact that the PSP is portable? Namco: In World Tour mode, the player is able to create a custom tour with preset time limits (5 min. to 60 min.) and the different car classes. Races are relatively short, just 3 laps, and the handling of the game is suited to instant pick-up and play. So many questions on this multiplayer game ... we just want to play some more! 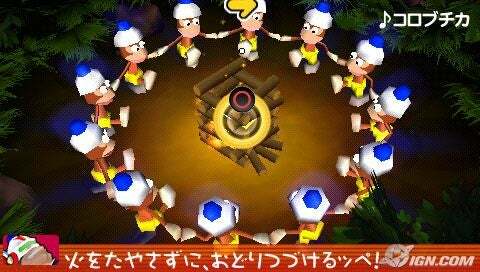 Q: We've seen Ape Escape 2 on PS2, can you tell us what is different about this game? Sony Computer Entertainment: It's completely different! This game features the same characters from the Ape Escape series, and the same sense of humour, fun and silliness, but this is an entirely new game. It's a collection of 50 quick and very addictive mini-games, focusing on short but addictive gameplay, multiplayer action and many unlockable features and collectable items. 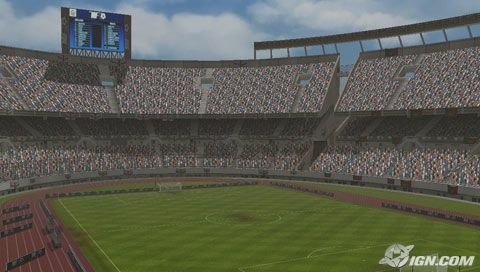 Some games have been designed specially to also allow two players to compete against each other simultaneously on one PSP, and repeated play will offer many varied rewards. SCE: Definitely not. This is a totally original game for the platform, with lots of new elements, and quick-fire play, perfectly suited to the PSP audience. SCE: With PSP being a totally new platform, we concentrated on the "portable" aspect of the hardware. Ape Academy offers mini-games that are not basic or minimalist but which use the PSP technology to provide detailed and colourful presentation with high quality animation and sound. We have included as many mini-games as possible and feel that players will be surprised and excited by the content. There are games which can be played by two people on the same PSP, and some by two players on different PSPs. There are also many games that use real physics in the gameplay mechanic to add even more depth and enjoyment. SCE: No, although guided by the same production division, these are entirely new staff to the franchise and are full of enthusiasm for the game and the new medium. SCE: From the many mini-games, we chose five games plus an extra mode for an ad hoc two player battle using WiFi. 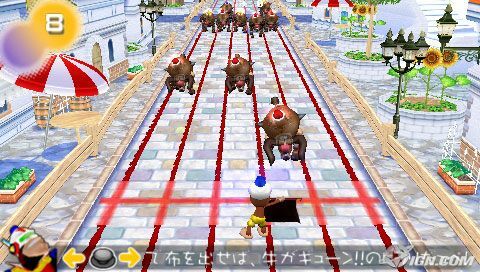 This is not just a WiFi game, players must bet the 3D Monkey figures that they have collected in the game, and fight for victory. The game allows the winner to collect the figures that are bet from the losers' collection. This is not simply a trading game - it adds real tension to the gameplay, and we feel that we have succeeded in adding real fun and addictive gameplay. SCE: The fact that being able to propose free-play styles as a game design on this advanced hardware, and provide a game full of expression is something we are very happy about. The team feels very fortunate to be involved in working on this amazing machine at such an early stage, and would love to continue producing high-quality games that can be played at any time, and anywhere. SCE: The fact that it is "portable" but the screen is so wide and the button position is symmetrical first inspired the team to design the game to allow two people to hold 1 PSP and playing games together. In Ape Academy we put in 13 games that can be played by 2 players on 1 PSP simultaneously. We feel our games' look and humour make them extremely endearing and will make players smile. This will also make the users want to walk around with it in hand to play with friends and partners. SCE Europe's serious racer will bring realism to PSP. Q: We've seen F1 on PS2, can you tell us what is different about this game? SCE Europe: F1 PSP will faithfully recreate all of the same licensed cars, drivers and tracks stages as its PS2 counterpart. The whole feel of the game is positioned differently from the console version. The emphasis is on quick easily accessible gameplay for the user and will aim to give short and exhilarating bursts of action all in a handy sized package. 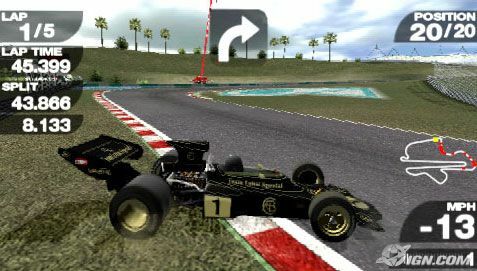 SCE Europe: No, F1 has been built from scratch by a different developer from the PS2 version. When it launches in May 2005, F1 will also be faithful to the 2005 season which won't begin until March next year and will also include the new Turkish circuit which the general public won't even see until August 2005. SCE Europe: All racing modes like Quick Race, Time Trial, Single Rally and Championship will feature a series of mini arcade style modes designed to take advantage of the quick pick up and play nature of PSP. This should allow the races to still be as immersive as Formula One games on PS2 but with more frantic action perfect to 'dip in and out of' whilst on the move. We've also added a Scenario Mode to the game, where players can re-race some of Formula Ones most memorable moments. SCE Europe: No, our chosen development team Travellers Tales haven't worked on previous versions of F1. This means that we can effectively build from the ground up and really concentrate on the unique game playing experience that the PSP offers. SCE Europe: Although the PSP has proven to be quite simple for developers to get their teeth into, what has been surprising is how powerful the PSP is once you get used to developing for it. This means that to be truly serious about PSP development, team sizes and costs remain comparable to PS2. SCE Europe: F1 will include the opportunity for up to 8 players to play head-to-head via WiFi on an ad hoc basis. This means that it will be easy to establish multiplayer games without the need to be linked via cables or hardware. SCE Europe: Yes, for the fist time ever with any F1 game, F1 PSP will include the ability for players to download real grid line ups and qualifying times taken directly from the 2005 season as the race events happen next year. This means that F1 PSP gamers will easily be able to race the season as it unfolds. If, for example, a team or driver got disqualified, or happened to do particularly well in a qualifying session, then you could choose to update the game with the correct stats and have the correct cars in the correct order on the starting grid. SCE Europe: The chance to be in at the ground floor of a new and fascinating piece of hardware. 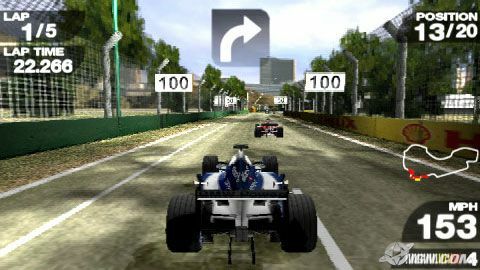 SCE Europe: We think that the way people play F1 on PSP will be rather different from the PS2, we don't think that people would want to sit on a train and play a full 65 lap race for instance, so while every mode will be there, its length and span will be set within the parameters of PSP play. Also diese Bilder zeigen erstmal was für ein Unterschied zwischen Ds und PsP liegen ! hm... warum sind die wipeout-bilder eigentlich grösser als die übliche psp-auflösung und trotzdem gestochen scharf? sieht mir dadurch eher nach bildern von einer ps2-variante oder so aus. die qualität der grafik nimmt übrigens bei den titeln von oben nach unten hin rapide ab. Für mich ist das irgendwie beruhigend das selbst das schlecht aussehenste Spiel für die PSP immer noch um einiges Genialer aussieht als die Spiele auf den Konkurrenzsysteme. @masterK warum musst du immer motzen gib dich einfach damit zufrieden das die psp bessere grafik hat als der nds! warum war ich mir sicher dass ich die sekunden stoppen kann bis die ersten kommen die sich aufregen dass ich beim anblick dieser bilder keinen gebetsteppich rauskrame? _-1g1--, hab ich IRGENDWO den DS auch nur ansatzweise erwähnt? ich habe psp-bilder untereinander verglichen, wenn du da keine unterschiede erkennst brauchst du sicher ne brille. desweiteren habe ich wegen der grösseren bildgrösse von wipeout gefragt.